Most of my ideas for creating a layered distressed aged patina have all been by accident. I’ve shared before that I love experimenting with paint. Sometimes I feel like a mad scientist or a creative cook when it comes to painting techniques. I’ll take a little of this, mix it with that and see what I come up with. 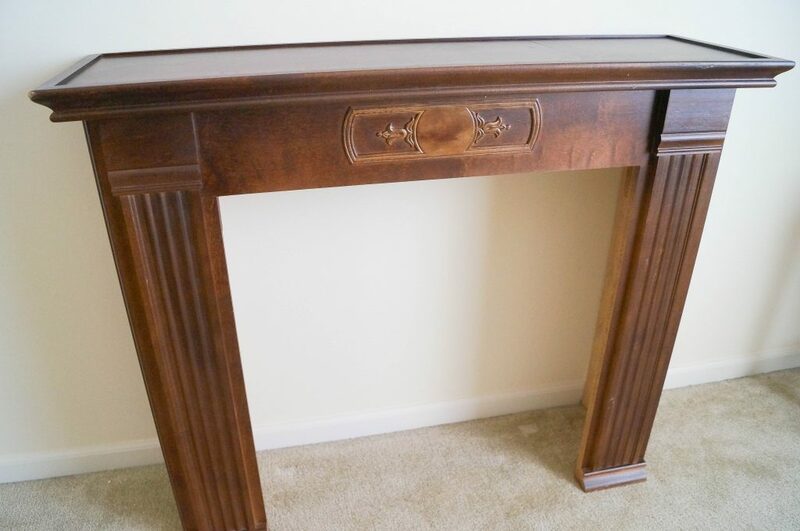 One of the pieces in my home that’s been transformed several times is my fireplace mantel. A few years ago I decided to play around with milk and chalk paint. I didn’t mix these together, instead I layered them creating a layered distressed aged patina. 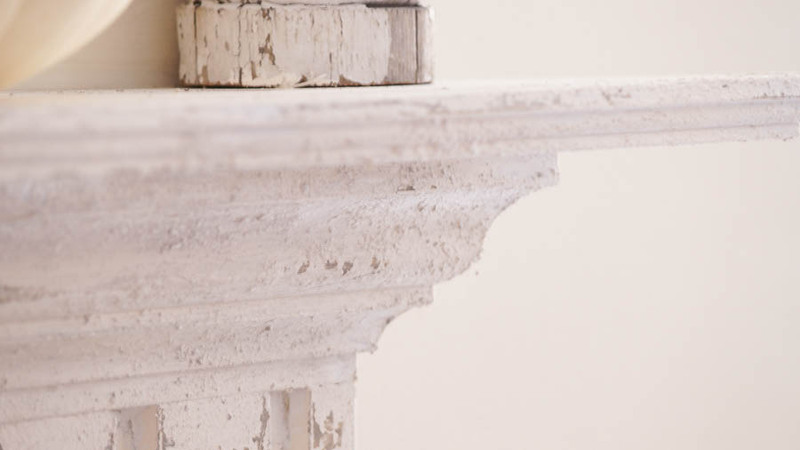 Click on this link to read Milk Paint Meets Chalk Paint. 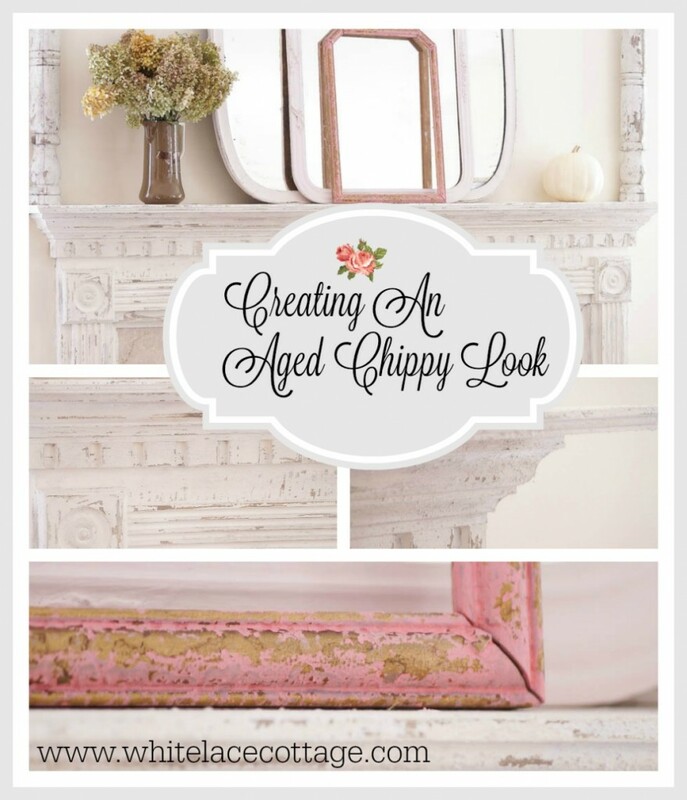 I love the aged look I created on my mantel in the photo above. But I felt it was time for a change. I thought it would be fun to experiment with a new texture. Sometimes ideas just come to me. I’m not sure how or where I thought of this technique. 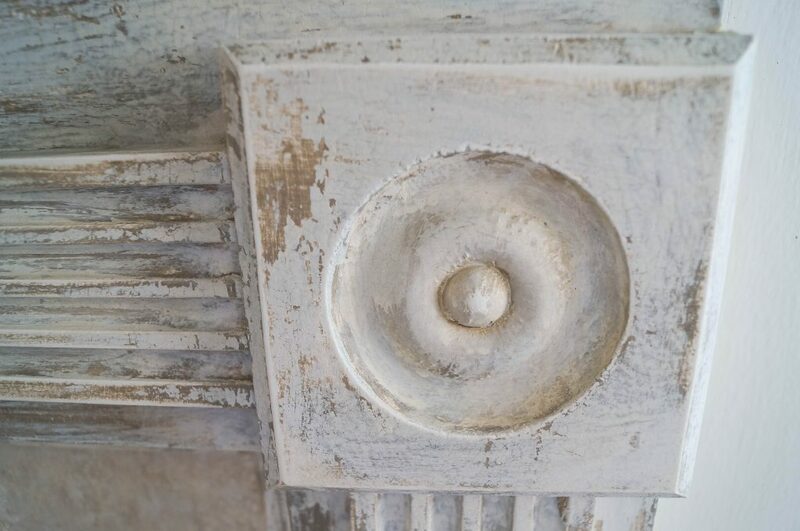 But the idea of using Venetian texture medium came to me while studying an old chippy worn piece of furniture. I wanted to create a textured look with lots of imperfections. Similar to what you would see if you found an old layered piece of furniture. This technique is super easy to do and you cannot make a mistake. I think the more texture and imperfections the better! Click on the link to read more about Creating An Aged Patina. Sometimes things happen by accident. Take this mantel for instance. I found it at a resale shop but the newer wood stain look….well it’s just not me. It was a very thrifty find, I believe I paid 45.00? I can’t remember but I know it was pretty cheap. I thought I would just paint it with milk paint because it would start to chip organically without any effort. It had a slick finish which works great with milk paint if you like that chippy look. I applied the paint to my piece but it was chipping a little too much. But instead of freaking out I decided to go with it. I walked over grabbed a can of chalk paint and started painting right on top of my chippy milk paint. It started creating a distressed layered aged patina that was beyond amazing! 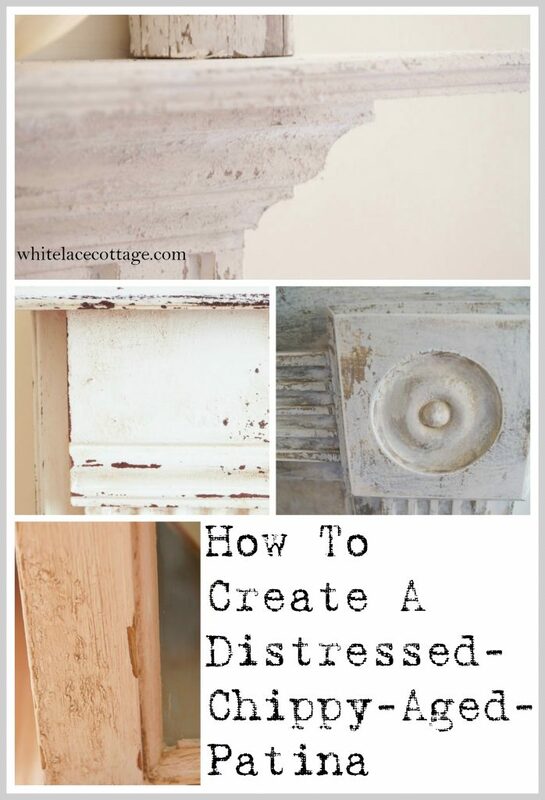 You can read more when you click on this link Milk And Plaster Paint. 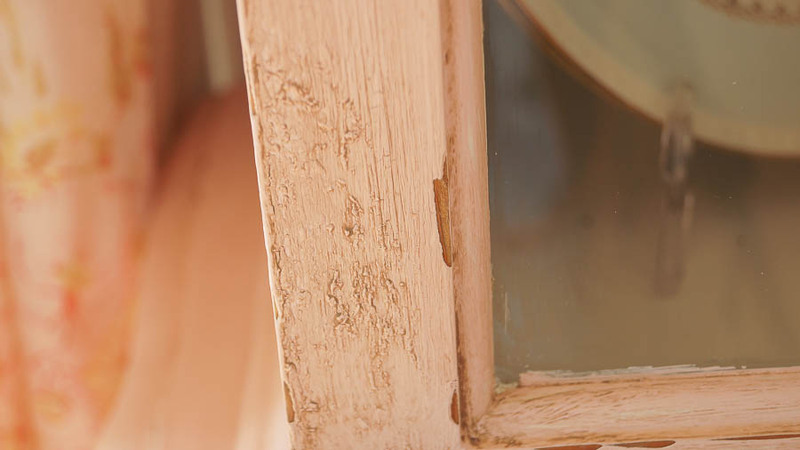 Another way to create an aged patina is to use Elmer’s glue. I know it sounds crazy but I’ve used this technique many times. 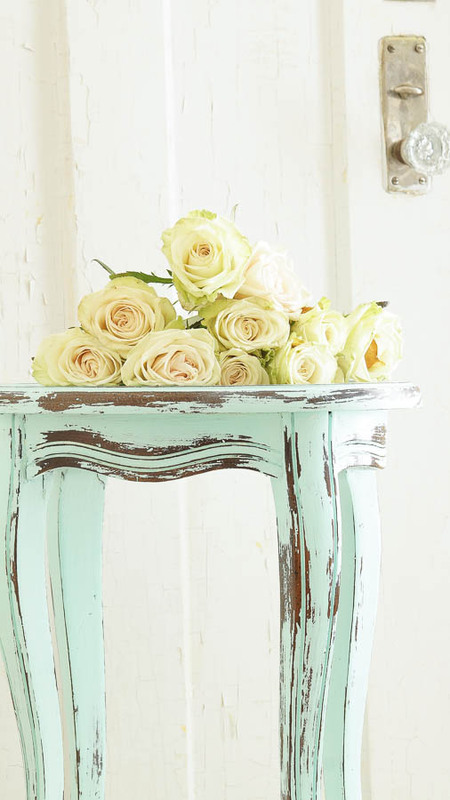 It’s similar to milk paint in that you never know what results you will get. You may end up with a small crackled look. Or it may have large crackles. 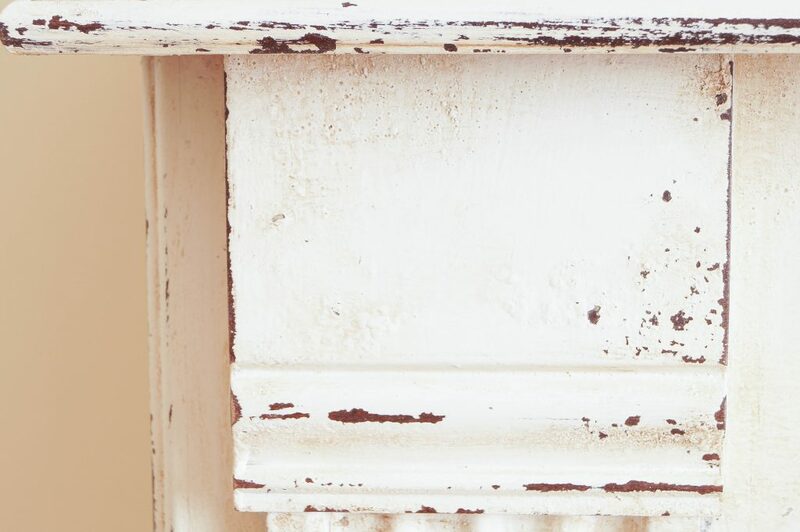 Some of the paint may drip and create texture that resembles an old piece of furniture with layers of paint. Using a dark wax will emphasize all the imperfections as you can see that in the photo below. Click on this link to read more on Chippy Patina. Just remember that when you are creating a layered distressed aged patina just go with it. Don’t try to create something that’s perfect. Even if it looks horrible if you keep working with it I bet you will create a beautiful one of a kind piece that has lots of charm and character. Do you like creating layered distressed aged patina? Let me know in the comments and share any techniques you enjoy. Make sure to read my favorite non-toxic so sanding technique for distressing furniture. 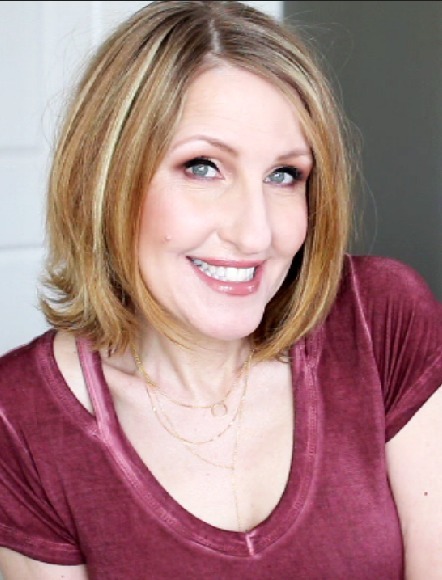 If you enjoying seeing hands on painting techniques, tips on decorating and makeup/skincare for mature women. Make sure you subscribe to my Youtube channel. I create 3 new videos a week! « Weathered And Distressed Technique Super Easy And Cheap! Hi Anne, hope you had good weekend, Do any projects? Have to admit have been slow to enjoy chippy, heavily distressed you display. So many people here don’t seem to like it at all, don’t buy pieces distressed. Is hard to know what they like, not too up on new looks or ideas. Makes it hard to know how to do finish on pieces. For our own pieces we keep I do a moderated distressing until I come around to idea of distressing more. Do kind of like chippy tho, what can I say. I like it on other peoples pieces just not my own. Maybe my age and what was in years ago., have to let brain adjust and it’s coming along, little by little,lol. Haven’t been on as much lately, our internet is so bad I get sick of waiting forever for every thing. Saw in paper ci council supposed to talk about it this Wed. writer asked people to email city council members before meeting and to go to meeting Just might do that. Am ready to move away from here for that and other things. Haven’t really liked it here as much as would be happier.. I loved MT and the people so much more. Attitudes here remind me so much of snooty in San Diego. Think I feel that way more due to dil’s attitude and way of behaving. Not fair to blame San Diego. DIl’s life is about what person looks like, how fancy their house is, what car they drive, where person shops, if person looks like they have money, none of which we do. .